More comparisons between the British countryside of today and that from 1959-1961 in the paintings of Charles Tunnicliffe in the Ladybird "What to look for..." series of books. I’m covering two pictures (more briefly each) in order to try to catch up a bit and allow me to start the Summer book, which should have begun in June (on Tuesday!). Ah well, Scotland’s seasons start a little behind England’s (as you’ll know if you’ve ever looked, from a Scottish perspective, at the suggested planting times in most British gardening books!). So, on with pictures 19 and 20 from the Spring book! Spring picture 19 has us out in the wild wood again, this time with a small herd of fallow deer standing among a mass of bluebells under a beech tree. There is a green woodpecker in the tree, along with a little wood warbler, while a nesting woodcock lies well-hidden and very still in the undergrowth in the extreme bottom right. A crab apple tree is in full blossom in the background. The beech tree (Fagus sylvatica) coming into leaf was one of the later tree species to colonise Britain after the last Ice Age and so is only native in SE England and SE Wales, but has been widely planted across the whole of Britain, not least as a popular choice of hedging plant, and so is now widespread in Scotland too. The New Atlas advises that its natural range in Britain has never been precisely defined, but this range is stable at present. As well as providing beech nuts, or “mast” in Autumn, popular with birds and pigs (and, yes, people too – I’ve eaten them), beech is also a source of firewood (I have a log store full, drying out for next Winter), a high quality, pale hardwood for wood work/ wood-turning etc and other, more unusual uses – at the moment, we have a batch of a beech leaf liqueur, beech leaf noyau, in preparation, made by pouring a bottle of (admittedly, cheap) gin over young beech leaves and letting it sit in a sealed jar for three weeks, before adding a solution of brandy and sugar. We made some last year and it is delicious. Our recipe came from Roger Phillips’ “Wild Food” book, although I found it also in Richard Mabey’s “Flora Britannica”. I won’t say much about the crab apple in blossom in the background – very widespread, probably stable in distribution compared with 1962, according to the New Atlas, but it is pretty difficult to know whether we are talking about a truly wild crab apple (Malus silvestris sens. str. ), or one that has hybridised with the introduced “domestic” apple (Malus domestica) whose fruit we more normally eat. I do remember my Dad tricking me into tasting a crab apple one Autumn when we were back visiting family in Ayrshire, his childhood haunt, and having my first unpleasant experience of the stringent crab in the raw! We have a few very prolific crab apples around the town in Stirling, each producing masses of fruit every year, but no one seems to collect and use it – something for the new Forth Valley Orchard Initiative to promote maybe? In common with all the other blossom-producing trees, our crab apples in Stirling had a cracking blossom season this year! The birds shown here have had a variety of luck since the late 1950s/ early 1960s, as seen from the trends shown here. The British Trust for Ornithology only has a graph for the green woodpecker (Picus viridis) in England, but you can see above that it is doing pretty well, the population having risen steadily in Britain since 1966, except for a period of stability or shallow decline around 1980, probably the result of a series of harsh winters. BTO reports there was considerable range expansion in central and eastern Scotland between the periods 1968–72 and 1988–91. As green woodpeckers are adversely affected by harsh winters, its success maybe a result of climate change leading to milder winters. Any fans of Bagpuss out there? Professor Yaffle, the brainy old wooden bookend woodpecker in the popular children’s TV show of the 1970s, was supposed to be a green woodpecker, and that name “yaffle” comes from an old country name for the species, based on its loud, ringing call. It was also known as the “rain bird”. My old AA Book of Birds suggests that this is because its call was more clearly heard in the atmospheric conditions before rainfall! I wonder if that has any basis in meteorological fact? The other two bird species, by contrast, the woodcock and the wood warbler seem to be on the slide, according to the BTO’ graphs. The woodcock (what a Latin name! Scolopax rusticola – sounds like a Doctor Who character) apparently declined rapidly and significantly on the BTO’s Common Bird Census survey plots for the three decades up to 2000. These did not, however, include many areas of coniferous forest where it is most commonly found, and as you can see from the picture, it can be quite cryptic anyway. BTO summarises possible causes of its decline: “Recreational disturbance, the drying out of natural woodlands, overgrazing by deer, declining woodland management, and the maturation of new plantations are possible causes”, but no strong hypothesis yet. And another measure, the numbers shot in Winter (including many birds coming from continental Europe in Winter) (woodcock is regarded as a gamebird as well as a wading bird by taxonomic relationship) have increased around threefold since 1945 and are currently running at a historically high level, so it isn’t really clear what the population trend actually is. The little wood warbler (Phylloscopus sibilatrix) up in the beech tree has a westerly distribution in Britain and is actually quite unlikely to be seen in Scotland. 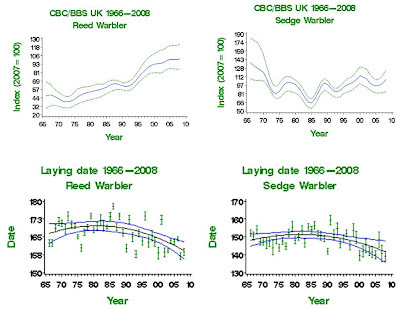 It has only been surveyed latterly by the BTO, as you can see from the graph, which also shows considerable and rapid population decline since the mid-1990s (as well as an egg-laying date that is becoming earlier in the year, in response to a warming climate). Declines are apparently evident across other parts of Europe but the BTO does not offer suggestions regarding the cause. 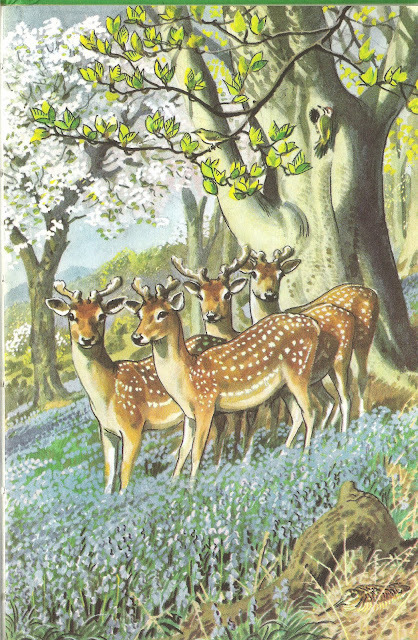 The fallow deer (Dama dama) in the picture are not native to Scotland, or even to other parts of Britain. I’m tempted not to say anything about them, or not much. According to the Joint Nature Conservation Committee’s report on the state of British mammals (would you look at the state of them? ), the distribution of fallow deer is” Local in Scotland, where its distribution includes three west coast islands.” But it doesn’t say which islands! Fallow deer prefer deciduous/mixed mature woodland and conifer plantations with open areas. The best estimate possible for the total pre-breeding population in Scotland is fewer than 4000, compared to maybe around 350,000 of the native red deer in Scotland. So you are relatively unlikely to see a scene like this in Scotland! On to picture 20, which is fairly simple to cover. 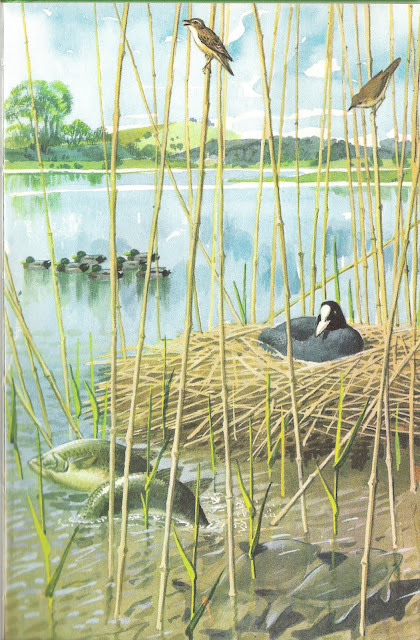 It shows a lake or loch, with a nesting coot (which I’ve discussed previously here), a group of male mallards, presumably without mates, gathered on the water (and mallards were discussed in Spring #1 here). Up in the reeds, there are two small brownish warblers, to the right a reed warbler and to the left a sedge warbler singing. In the water below, there are some large bream assembled to lay their eggs. The common bream (Abramis brama) is a member of the carp family and for advice on its status in Scotland, I turned to Professor Peter Maitland, and specifically his book: “Scotland’s freshwater fish. Ecology, Conservation and Folklore”. The bream is not a native fish in Scotland, but has been introduced to southern Scotland, where it has been established in the Annan catchment for over a century, or longer. It has also been introduced by coarse anglers to waters in the Central Belt in the final decades of the 20th Century. Professor Maitland concludes that the bream has no special protection in Scotland and, as an introduced and potentially damaging species, does not warrant any particular measures! The reed warbler (Acrocephalus scirpaceus) prefers to live in reedbeds, where it is quite difficult to survey accurately, according to the BTO. Nevertheless, its population seems to be increasing (as shown above), and its range is extending into Scotland, where it is now regularly recorded as far north as the Tay reedbeds between Dundee and Perth. Like most of the other warbler species covered in this blog, its average egg laying date is advancing earlier in the year, in this case by a week between 1968 and 2007. 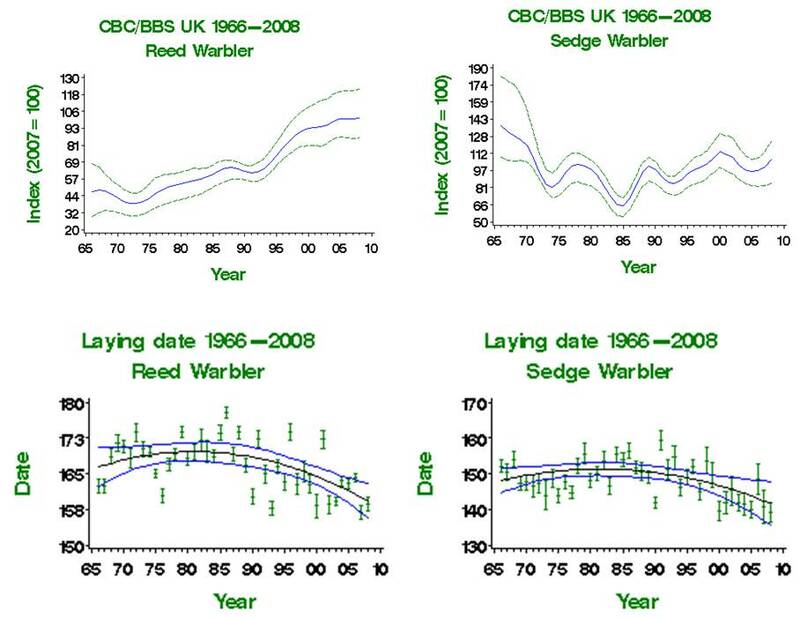 The sedge warbler (Acrocephalus schoenobaenus) singing near it in the picture is a much more widespread and common summer breeding visitor in Scotland, although its fortunes are much more varied over the last 50 years, as the graph above shows. Detailed analysis of BTO data has shown that much of the year-to-year variation in population size is driven by changes in adult survival rates which, in turn, are related to changes in rainfall on their wintering grounds, just south of the Sahara Desert, in the West African Sahel. Four troughs in population are related to years of poor West African rainfall, with a low point in 1984–85. Breeding records in Scotland have increased by 29% since 1995. Again, this warbler's egg-laying (average) date has advanced by nearly a week over the last 30 years, maybe an effect of warming? The sedge warbler has the most amazing, rambling and complex song that, although jarring at times, is endlessly reworked, including mimicry of other species, and has been compared with that of the nightingale! Aw Kirsteen - ye poor wee things up there - what's not appearered yet? The bluebells? All good things come to those who wait, gratification deferred, etc, etc! You have the most interesting blog, and a wonderful way of writing. I will be back! Thanks DF - that's very kind. Glad you like it. Come back soon - it'll soon be summer! Thanks for taking the time to comment... much appreciated at this end! If you've enjoyed reading this post, why not sign up to follow this blog? I won't even make you wear a robe, cape, costume or anything, unless you insist. Go here - look at these! And time and place are lost."